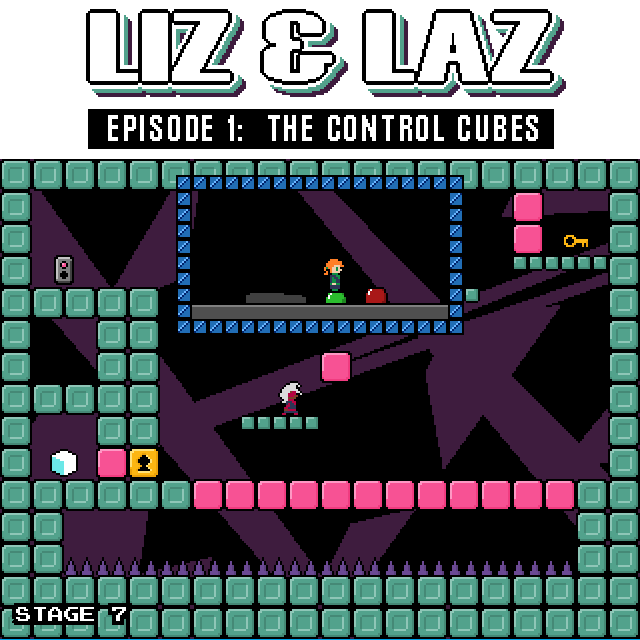 When a freak accident destabilizes the stabilizer, the control cubes go missing and Liz and Laz must work together to secure them! Laz transports into a hazardous landscape and relies on directions from Liz to keep him safe. Taking direct control of Liz, you’ll issue controls to Laz remotely. Liz uses a life-sized game controller to tell Laz to move, jump, and shoot. She jumps on buttons to guide Laz to the control cubes. Initially designed to be a quickly dashed-off, intentionally frustrating game, I ended up really liking what this became. Inspired by ZZT Engine games (including my own Punctuation People), Lemmings, and the games Nanairo ringo and Kaerazu no mori by Kabusoft. After the release of this game–the 90th I’ve released–I wrote up a reflection on my blog on my past two decades of game-making and some of the influences I was mindful of when I approached this game in particular.